How many times have you ever been told to RTFM (Read the Fine Manual) when you got stuck with a problem? As a technically inclined person, even I myself find such responses unhelpful, especially when it propagates a snobbish, elitist attitude towards those who may be genuinely seeking help. 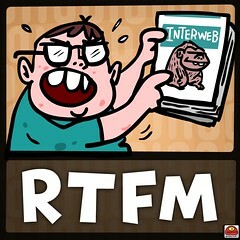 For most non-trivial problems, RTFM is probably the most time-consuming and least rewarding activity. Even worse, when the problem is truly cryptic, there is even a likely possibility that the manual will not have what you are looking for! Unfortunately, the phenomenon of not finding what you want in the manuals happens more often than not in real life. Besides, the quickest way to learn something, is to ask somebody who already knows the subject matter well. Most will be able to provide you with the right information straight on, or at least point you to the right direction to start looking. Just by knowing where to look will already massively reduce the time you'll spend scour at all the wrong places, minimizing unnecessary time loss from scanning through wrong documentation. If you do not have the luxury of a friend who may know, Google is your next best friend. Querying a search engine will probably people who may have the same questions you have, and if it is widespread, generally someone will have posted up the solution out there. If Google turns up with nothing, the next thing to try is to look out for mailing lists, IRC channels, or forums where you can locate people who share the same interests. Many will be helpful, and some will probably be experienced enough to give you an immediate answer to what you're looking for. Personally, it has been amazing to find out how much you can learn by just reading chatlogs of special interest group channels on IRC. nowadays, the RTFM isn't that much applicable anymore, what with the manuals getting thinner and thinner, and in most cases, only available in convoluted compiled HTMLs. Yeah, these cheapskate software companies who won't even spend their money on cutting down those useless trees to make them into nice glossy manuals that we can use for our monitor stands, how annoying is that! Don't even get me started on HTML man.. why can't they do anything in ASCII, like the good old days?! HTML is great, ASCII isn't darn bad too, as long as we don't have to live with some archaic format like EBCDIC!